In January 2016, We finished the design of the track in SketchUp according to the most common specifications, which is a 32' long track that is 48" high. We took ideas from the plans here and here, and invented a few of our own ideas. 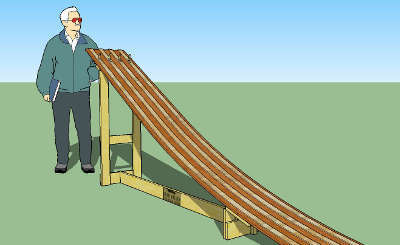 In theory, a complete 3-lane track can be built with a single sheet of plywood, a few scraps of board, and lath strips. But to increase the number of cars that can run at one time, and ultimately the number of races each participant can race in, we opted for a 4-lane track instead. In February we hand-selected several good looking sheets of plywood from Home Depot (this took a while), and ripped the guide strips on a table saw. 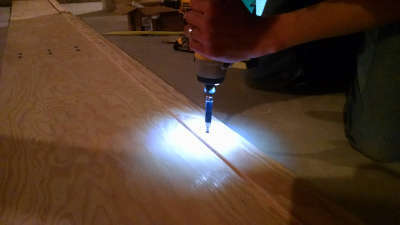 The 1/4" thick guide strips are screwed onto 1/2" plywood sections 8' long by 15-3/4" wide. When the track is assembled and raised to its full height of 48", the curvature causes the guide strips to lengthen by 1/16", and so a small gap is built into the design to accommodate this. 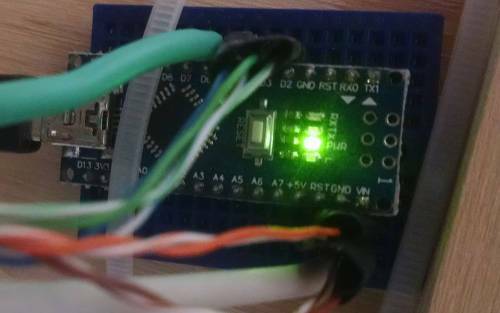 The strips are screwed to the surface with #4 screws--not glued--so that the guide strips are free to expand and contract when the track is raised and lowered. 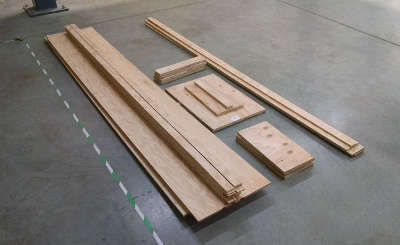 The joints between the track sections are subject to extreme stress and are each secured to a section of sturdy 3/4" plywood with eight machine screws on each side of the joint. 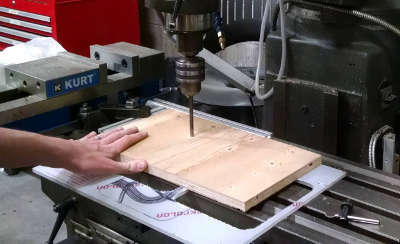 In March these connection plates were drilled on a CNC mill, then the track sections were match-drilled to these so that in theory, the track sections could be interchanged. In April we sanded, coated with polyurethane, and sanded again. And sanded some more. In May, we used scrap pieces of the plywood to build legs for the track, which fold up neatly underneath the first track section for storage. The 32' long track was first assembled in my basement, which has a single uninterrupted length of 32' 6" -- barely long enough to assemble and test the completed track. The night before our first race, we constructed the starting gate, finish line, and wired and programmed the electronics. The night before. During our first race we were literally moving wires around in a breadboard trying to get things working. Over a year and a half later, the track requires minimal maintenance and can be assembled or disassembled in about 20 minutes.